We offer a wide selection of contact lenses including disposable soft contact, bifocal/multifocal, toric, and colored lenses. 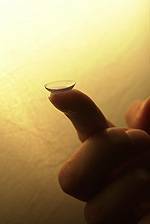 Whether you wear daily, weekly or monthly disposable soft lenses, or gas permeable lenses, we will find the lens that is best for your needs and for the health of your eyes. We will determine the best fitting lens based on your lifestyle needs, the shape and health of your eye. In most cases, you'll have the opportunity to try lenses on the same day as your exam. We take the time to teach all our new contact lens fits proper contact lens care and also possible consequences if proper care is not taken.